Kent Kresa ’59, SM ’61, EEA ’66, has taken one of the least comfortable seats of industrial power in the U.S., Bloomberg.com reported earlier today. He has been appointed as General Motors’ interim chairman by President Obama’s auto task force. Already a GM director, he will focus on replacing a majority of the board as required by the task force in time for a vote at GM’s August annual meeting. Kresa’s quiet but stellar reputation for corporate salvage and successful mergers made him a prime candidate. He masterminded the successful turn around of Northrop Grumman in the 1990s despite severe contraction in the industry. The company became a $28 billion enterprise under his guidance. His three MIT degrees are in aero/astro. According to a 2002 BusinessWeek article on the top 25 managers of the year, Kresa grew up in a show-biz family. His father was songwriter Irving Berlin’s chief assistant, and Kresa was a child actor. He certainly will be on stage again in this job! In January 2009 a group of MIT alums launched a nationwide SAT vocab video contest on BrainyFlix.com where they asked people to create short videos that would help students learn SAT words. In a few short months they received over 700 submissions! Take a look at some of the entries and vote for the one you like best. BrainyFlix is offering $600 in prize money to the video that receives the most number of votes. $200 of the payout will go to the maker(s) of the video and $400 to the class or school club of his/her choice. Voting closes April 12. Need to double check the meaning of clandestine? Watch the video. Ever feel like screaming but darn that societal convention that prevents you from publically shouting your frustrations? The ScreamBody, developed by Kelly Dobson SM ’00, SM ’02, PhD ’07, might be just the thing for you. Scream as loudly as you want into the portable device and your scream is both silenced and recorded for later playback. Watch the video to see it in action and find out exactly how it’s constructed. ScreamBody was part of Dobson’s Wearable Organs research at the Media Lab. Unlike self-help gadgets that are usually hidden, such as hearing aids, Dobson’s very visible inventions are meant to be social-critical activists—they perform a function while also announcing their own need for existence. Boston and surrounding areas celebrated Restaurant Week in mid March and although the reduced price of $35 for a multi-course course meal might be a break for most, it’s still quite expensive for a college student! That’s where our awesome class council stepped in, subsidizing part of the meal down to a more affordable $15 (for dinner). I was randomly placed at Sel De Le Terre (I have no idea what that means in English, but I suspect someone will tell me! ), a classy french restaurant in Back Bay Boston. This year, we were only allowed to sign up to dine with one friend; the rest of our tablemates were chosen at random to increase mingling with other 2010s we might not know or know well. It was really fun, but also a strange reminder that there are so many (cool) people in our class that I’ve never even seen around before. With over a thousand students in my class, this seems like an obvious statement, but I’m a little uneasy with the concept of graduating having never met so many of my classmates. Alums, what sort of role did your class council take during your time at MIT? Events like this? Something different? Did you even have an active class council with a (fairly large) budget? I would love to know! Below are a few responses on our Facebook discussion board. You are annoyed at having to renew Kerberos tickets every 10 hours. After you send an im, you follow it with a dot on a line by itself. you optimize the dishwasher loading at a friend’s house when you are invited for a dinner party. When you arrive five minutes after the hour for every appointment. 🙂 Btw Mr. Larky [above], glad to meet a fellow dishwasher optimizer! When people ask you your major, you reply with a number. Sound familiar? Join the discussion. Yes, it’s true. Vannevar Bush, former MIT professor, VP, School of Engineering dean, and Bush Room namesake makes the list of MIT’s appearances in anime as compiled by the student MIT Anime Club. Don’t believe it? Check out the list and discover the Bush connection to anime. The club, which aims to increase awareness of Japanese animation in the MIT community and the general public, is one of the largest and most active anime clubs in New England. It holds free public showings (most with English subtitles), usually on Friday nights. Learn more about the club and viewings. As the Anime Club’s page notes, MIT is usually used as a “generic non-Japanese source of advanced technology” or “hangout for smart people who didn’t manage to get into Tokyo University.” But given that references to any other American institutions of higher learning are rare, it’s an honor just to be mentioned. One such nod to MIT is shown below. In Hanaukyo Maid Tai, episode 13, the character Shinshei goes to a leading unnamed (yet recognizable) university. Some 17 years ago, Kamal Meattle SM ’67 was dying. He had become allergic to New Dehi’s air and his lung capacity was down to 70 percent. His doctors offered little hope. 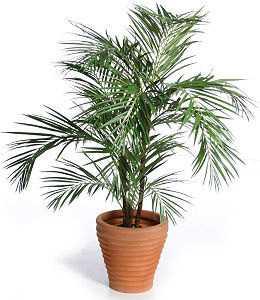 Areca palm, one of three air-enhancing plants. Rather than desert his home town, he turned his environmental interests into life-saving work. He established the Paharpur Business Centre and Software Technology Incubator Park, which provides offices and services for growing businesses—and some of the cleanest air in the megacity. In a recent TED video, Meattle describes how his green business was built through air-filtering plants and sustainable architecture. He shares research that documents reduced health problems and energy consumption while increasing productivity through the use of just three types of common plants, which you can grow in your own home or office. He’s now looking at larger experiments designed to reshape India’s commercial building ecology.